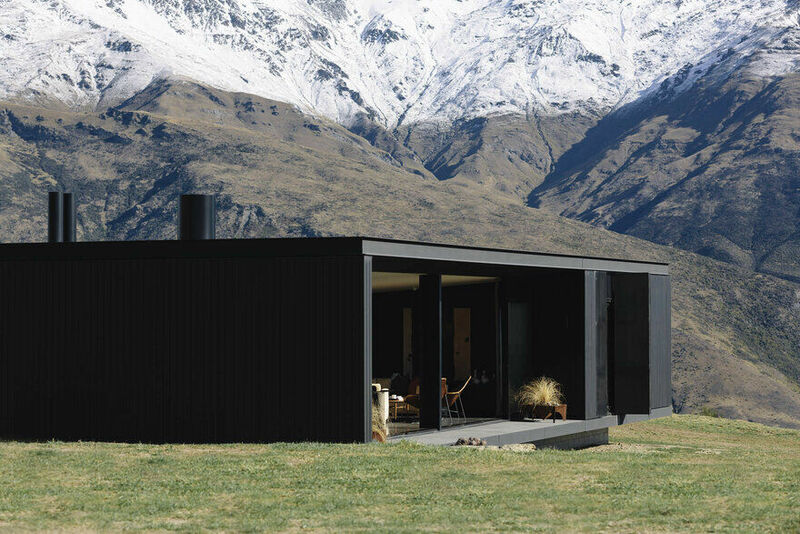 Earth hugging, black and brooding, this ‘spaceship’ for a film industry client and family (with many sci-fi film credits) has a hint of the dystopian about it. 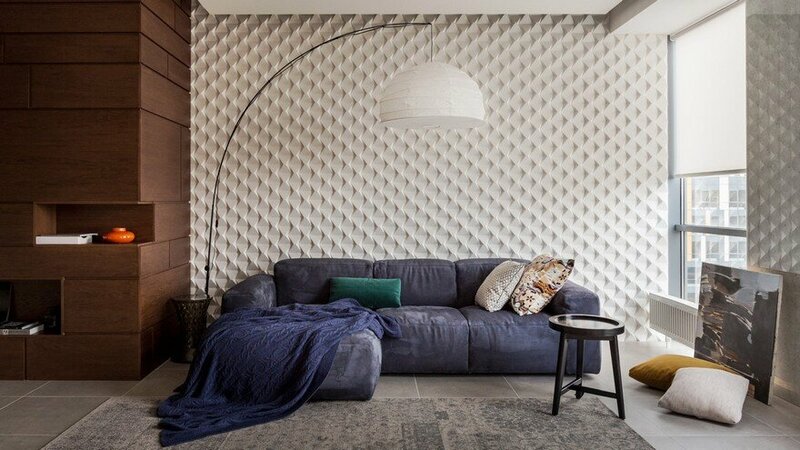 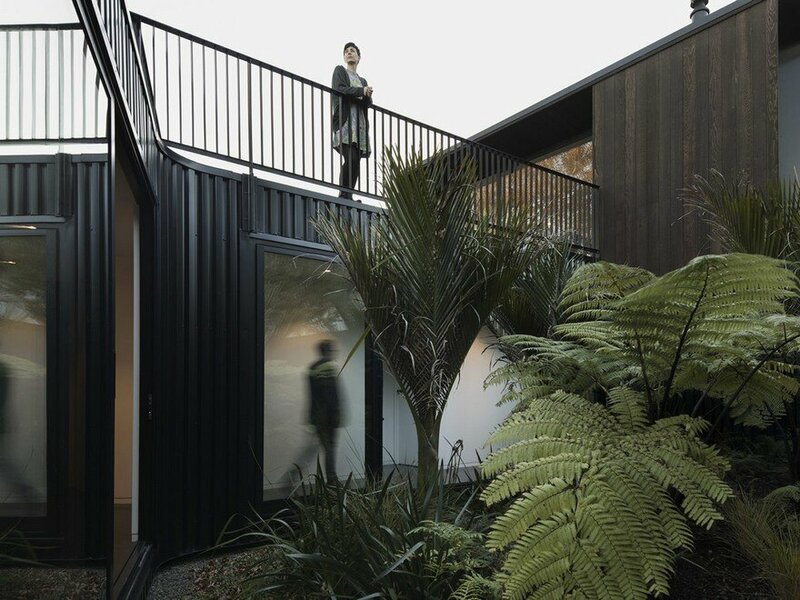 The design solution embraces both the slope of the site and the request for a flat north facing yard. 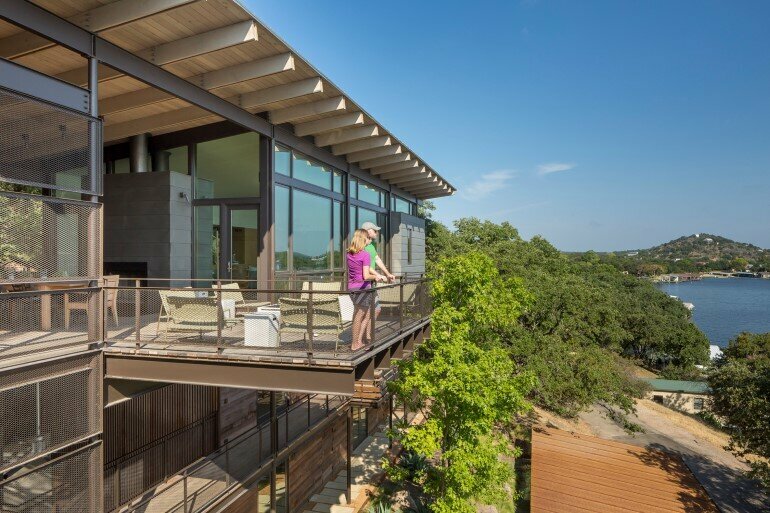 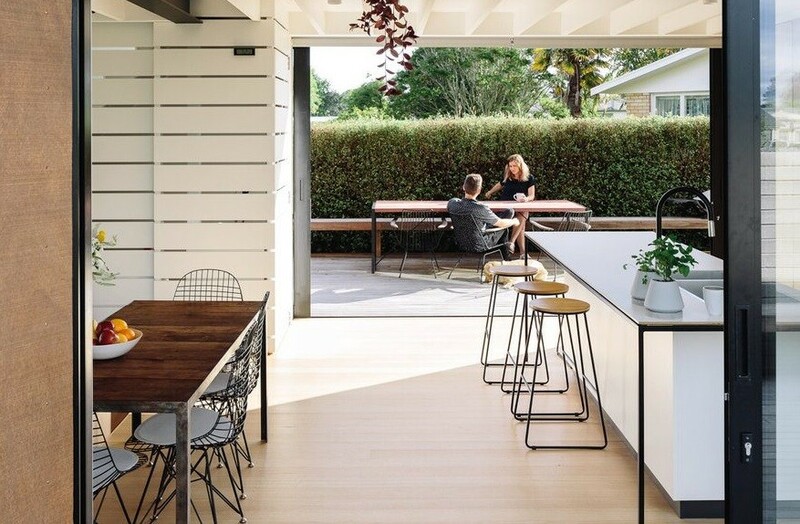 The level of the rear yard continues through the generous living volume and appropriates the roof of the volume below as an informal outdoor deck. 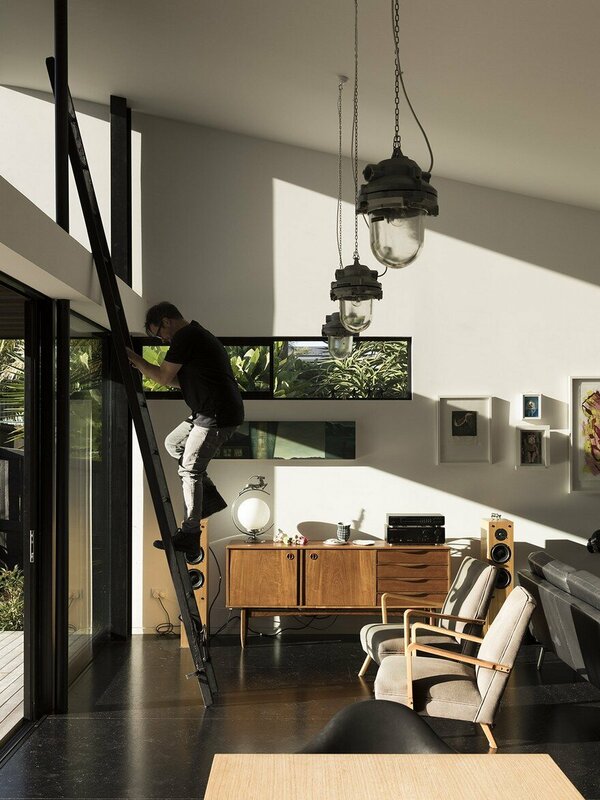 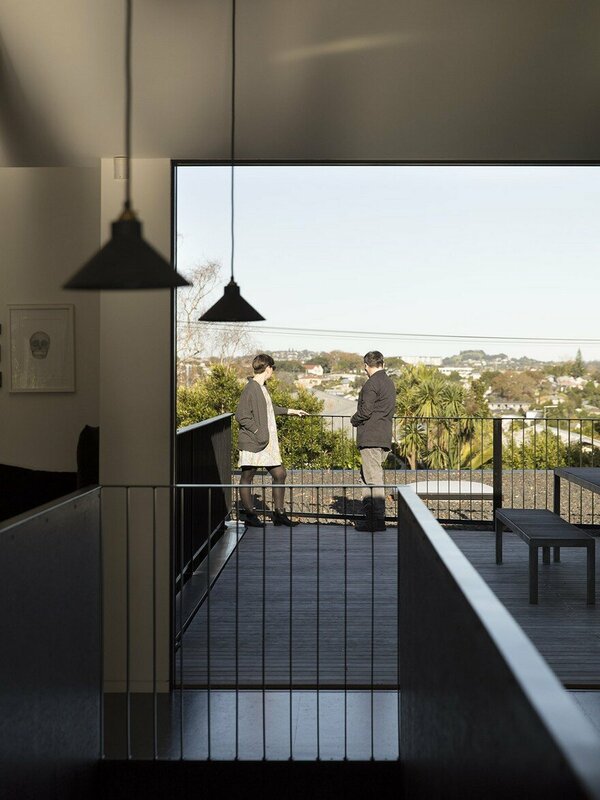 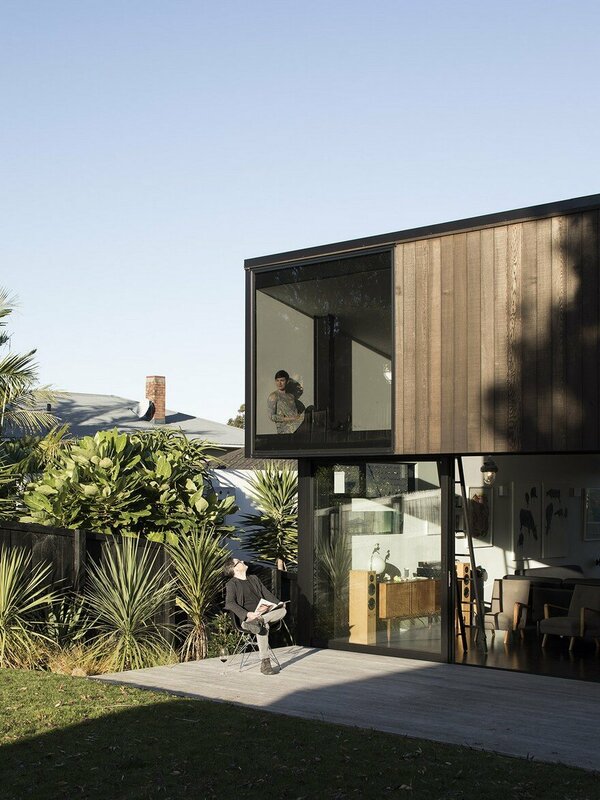 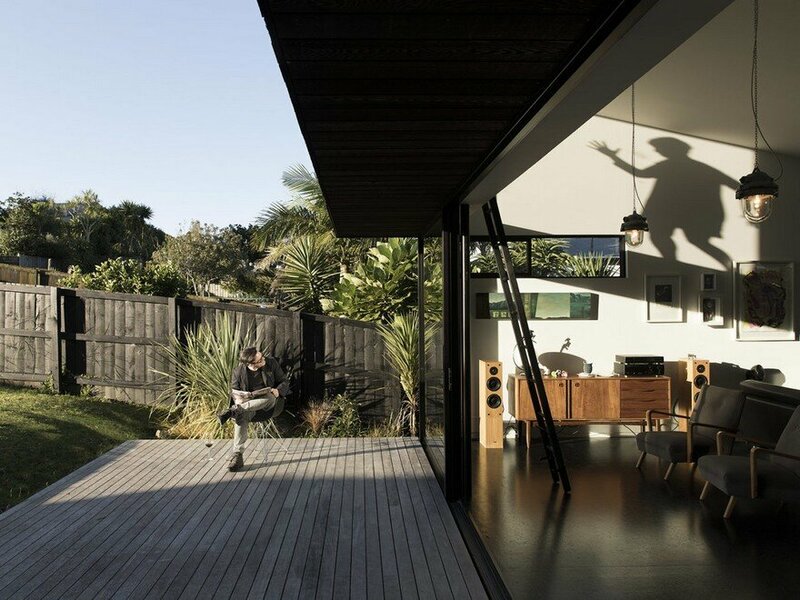 The eyrie provides views of Auckland’s volcanic cones and is an extension of the living area that maximises the usable outdoor space of the site. 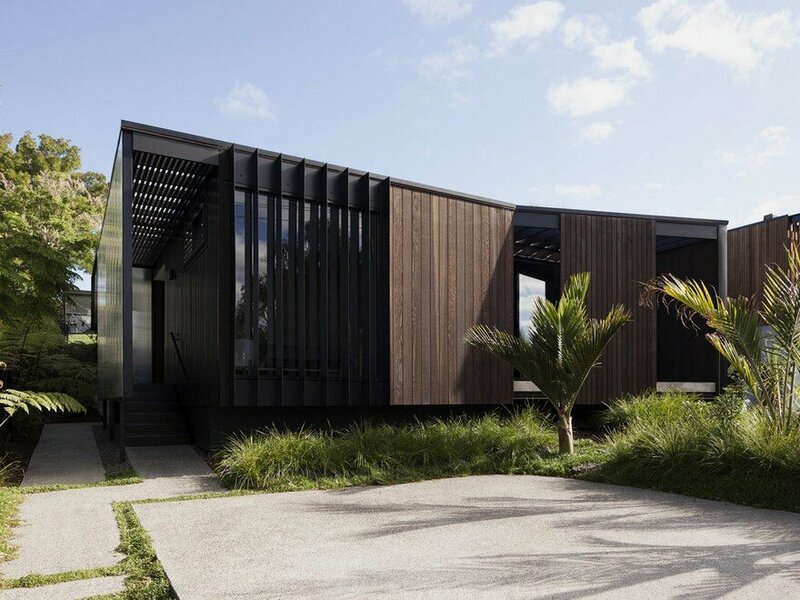 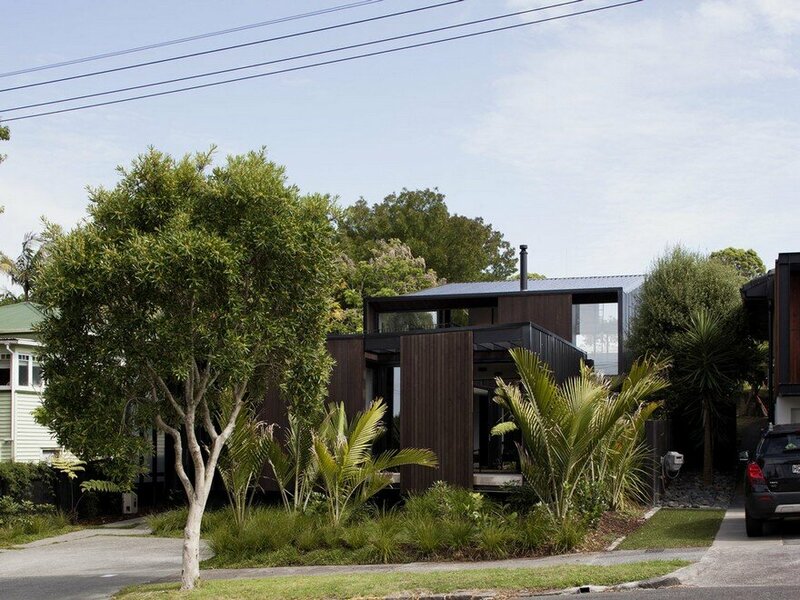 Steel screens and profiled-metal cladding and roofs accentuate the heavy metal theme, while cedar to the north and the street elevation softens the house as a neighbourly presence in the street. 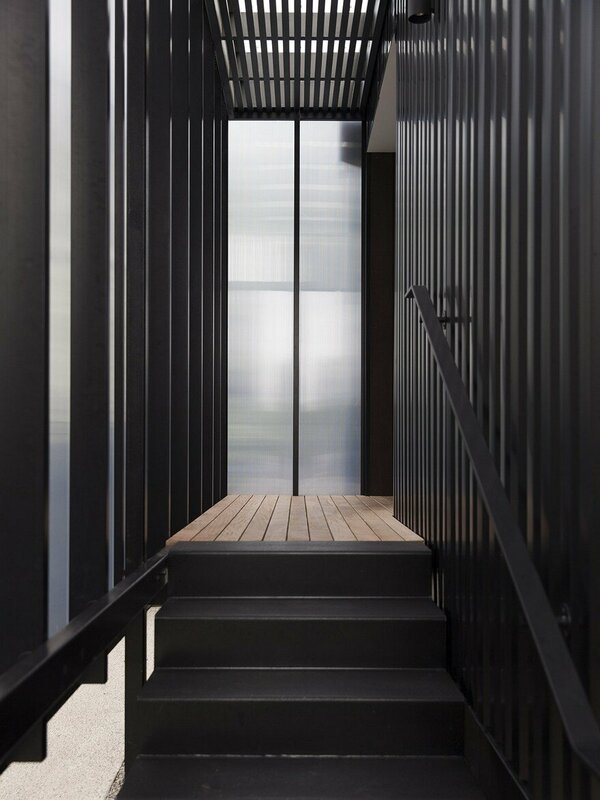 Entry to the house is through a steel and polycarbonate walkway on the side of the building. 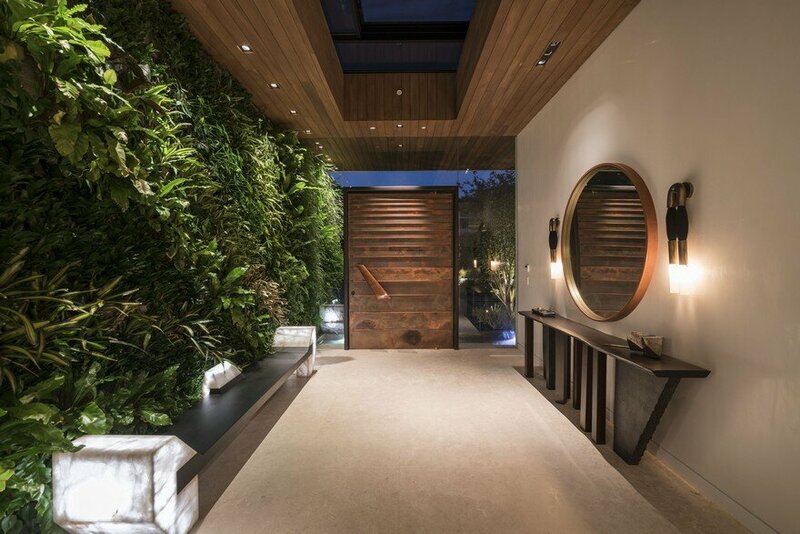 Once inside, a glazed courtyard planted with dense natives is revealed. 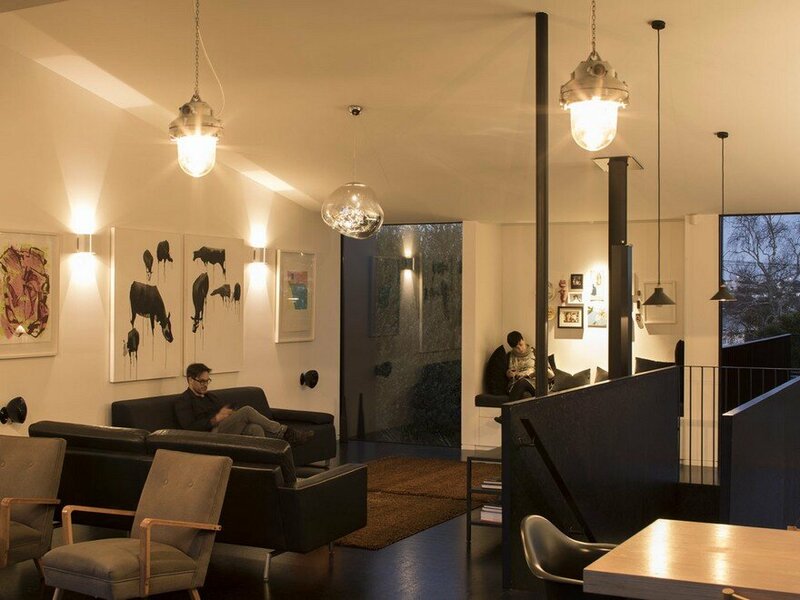 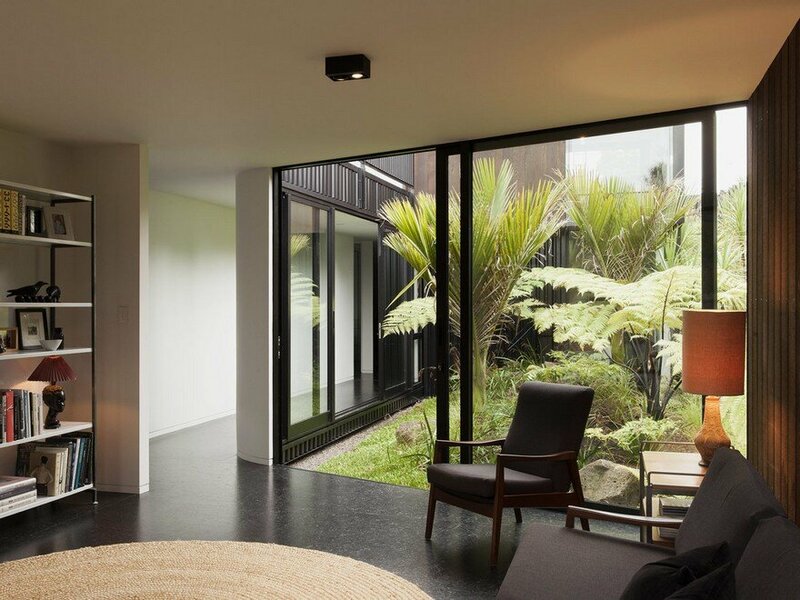 This light filled void is at the heart of the home and is the pivot for circulation into the bedrooms, bathroom and the common second lounge that expands from the hall to create a connection through the courtyard to the street. 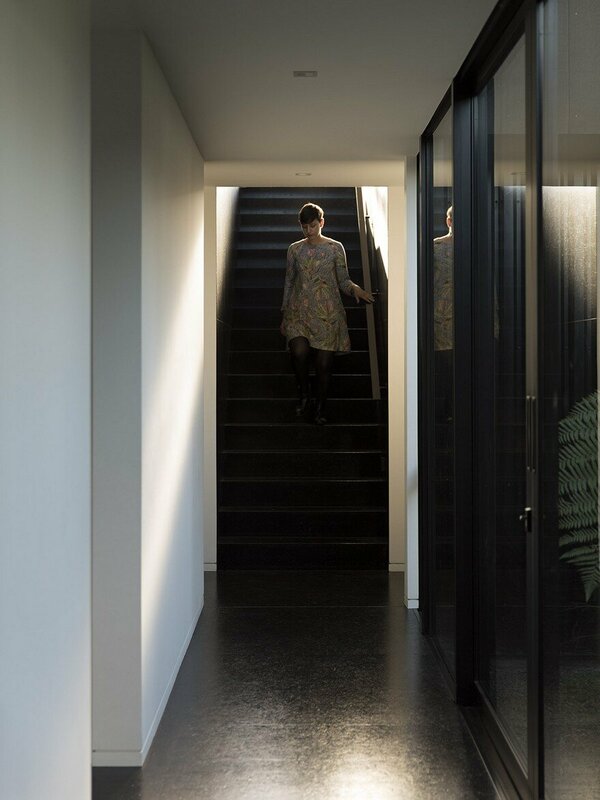 The straight-run stair ascends to the middle of a large living area though a black strand board void. 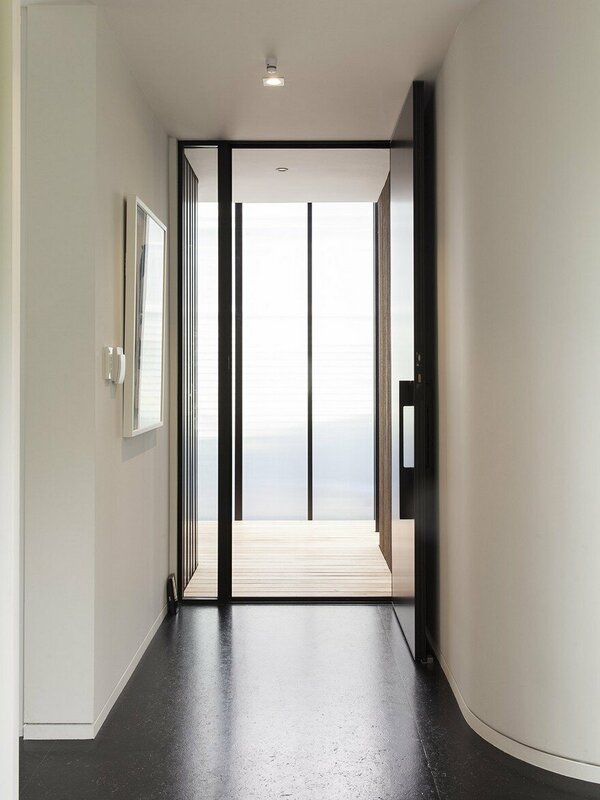 The movement from light to dark, and from contraction to expansion is designed to create a point of inflection in the interior. 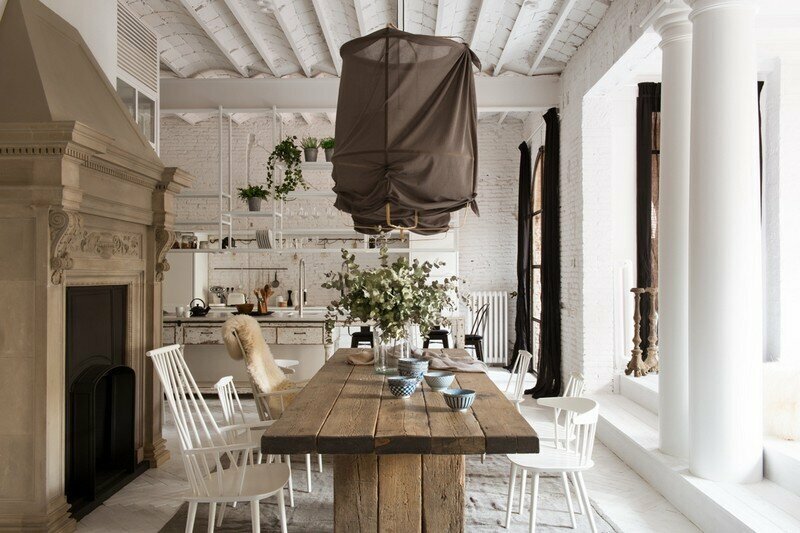 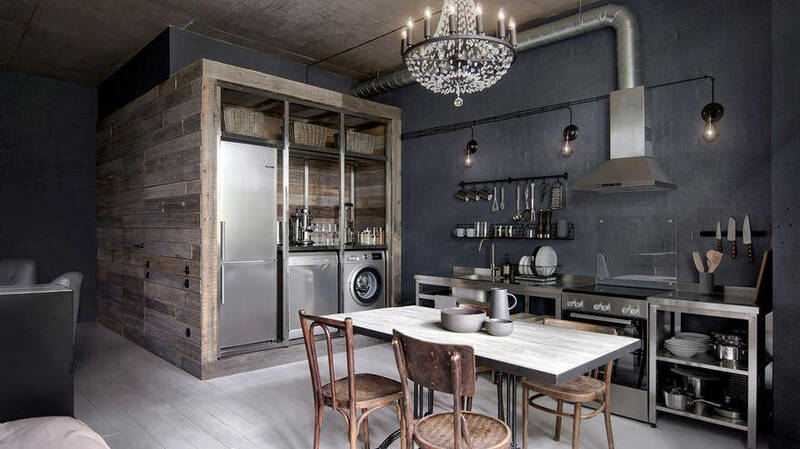 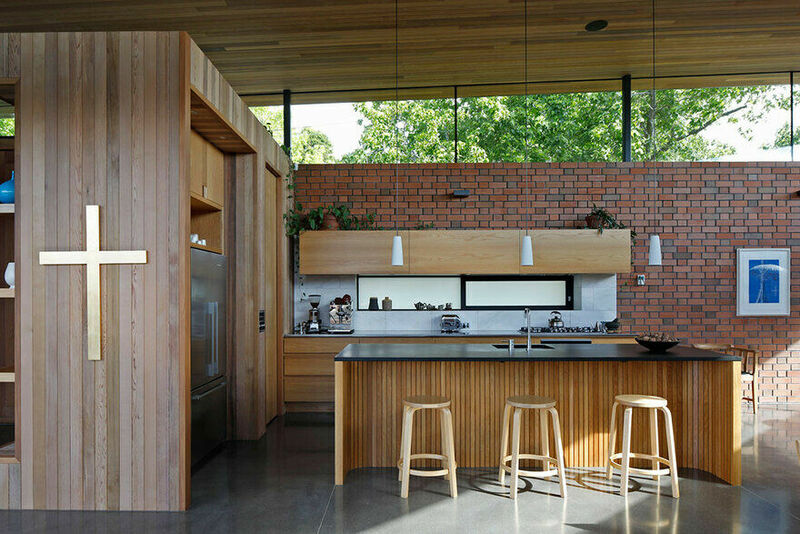 The kitchen, to the west, opens out to the roof deck. 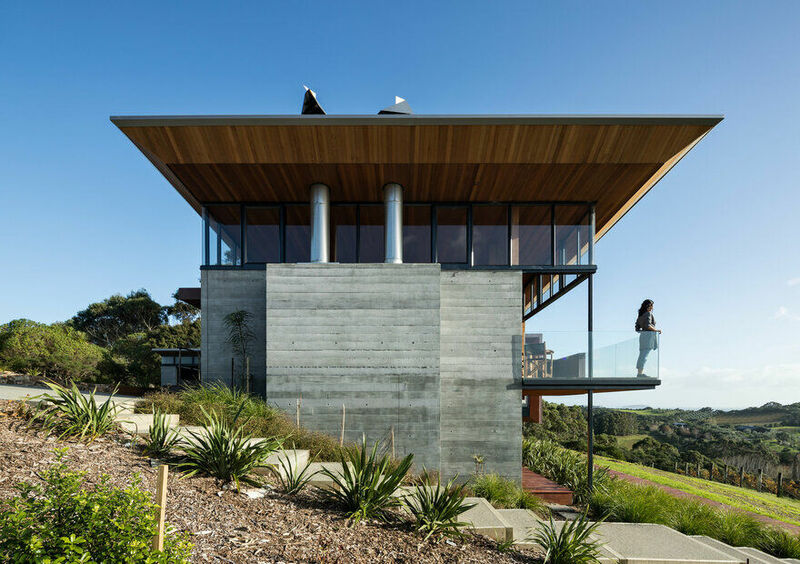 The sloping roof forms follow the contours of the site, culminating in an overhanging north deck. 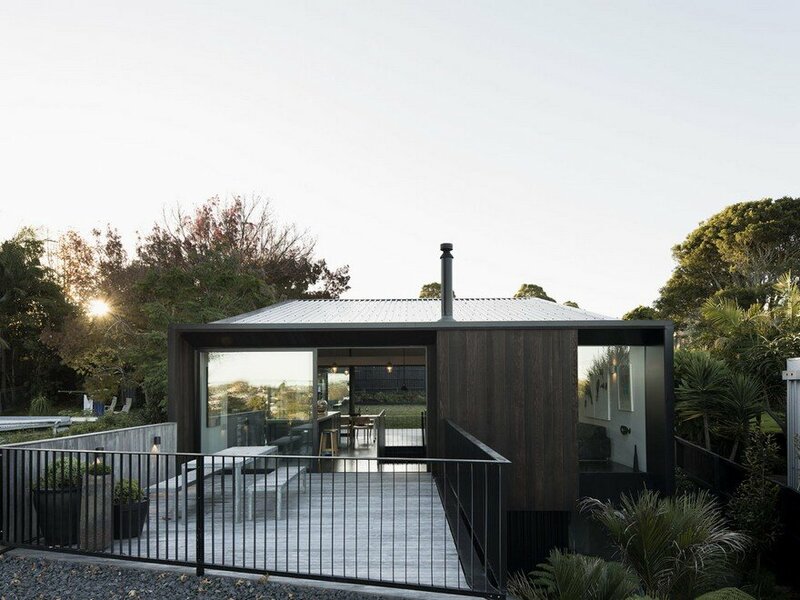 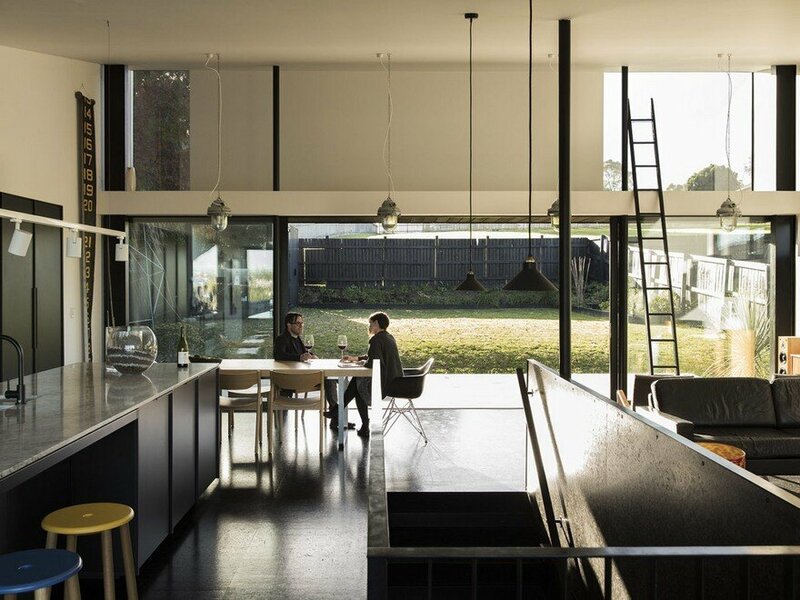 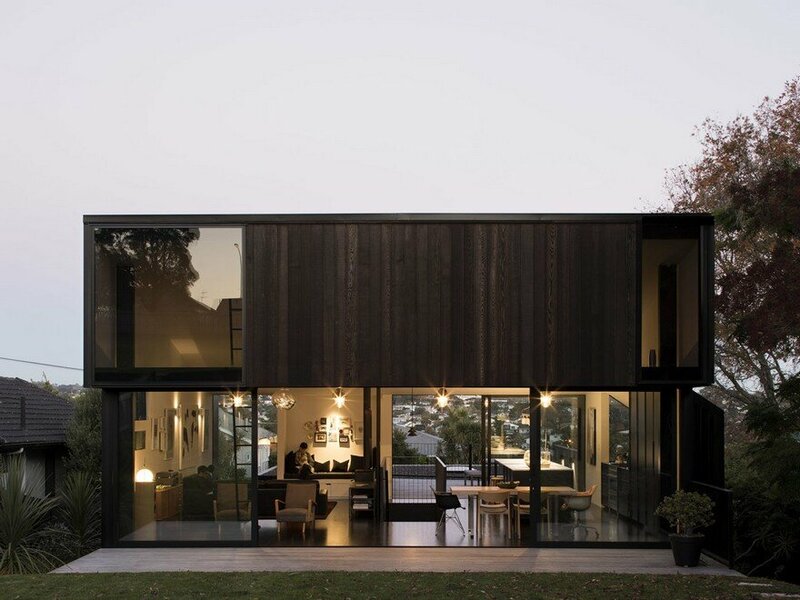 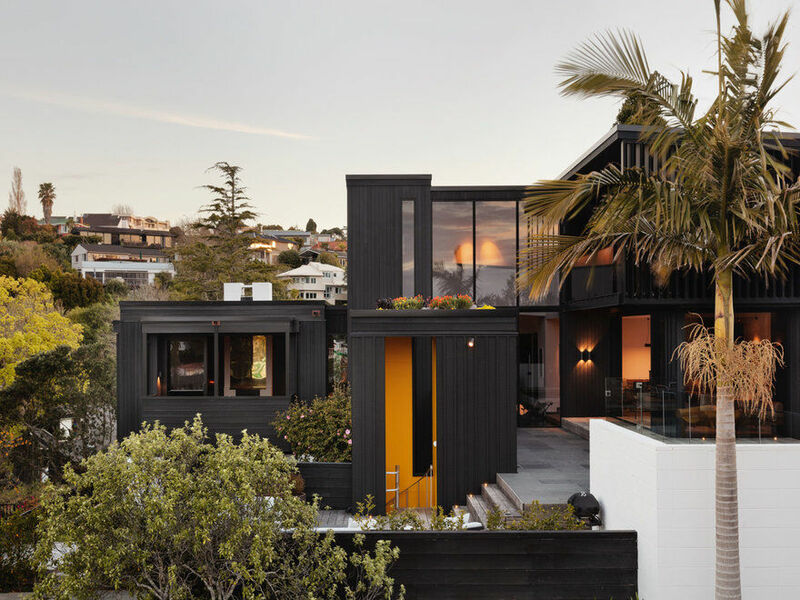 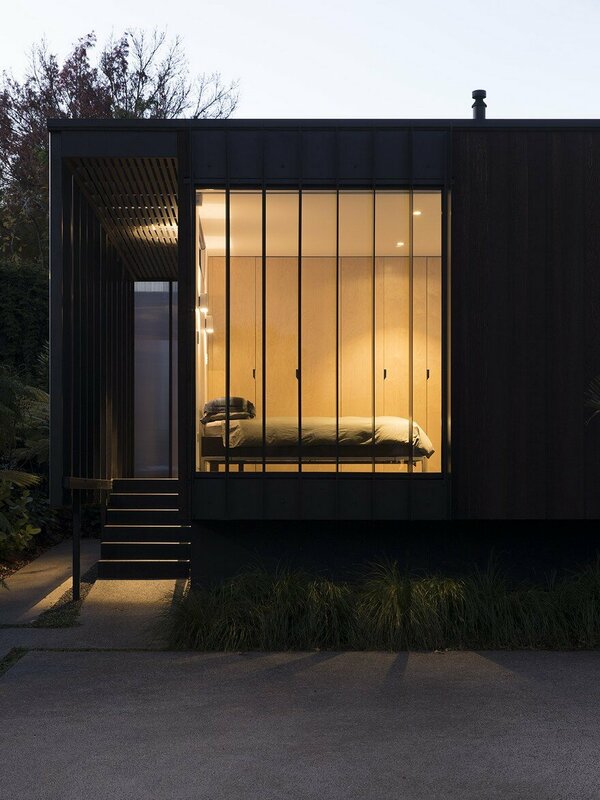 The steel-framed home shapes itself around an intimate connection with both its planted landscape and urban environment, in pursuit of a new suburban approach that is both robust and humane.